When Microtechnology moved toward fluid flow, the field of microfluidics or microflows emerged. In a microfluidic device, a fluid (liquid or gas) flows in channels or tubes with dimensions from 0.1 microns (micrometers, µm) to a couple hundred microns. In a microfluidic device, flow may be caused by capillary forces, natural convection, or even a microscale pump. Microfluidics is a multidisciplinary field of sciences bringing engineering, physics, chemistry, micro and bio technologies together. This is one of the interesting aspects of this field. The behavior of fluids at the microscale can differ from microfluidic behavior in that factors such as surface tension, energy dissipation, and fluidic resistance start to dominate the system. When the size of the channel/tube decreases to nanoscales (10-9 m) , some of the macroscale rule does not even exist! Microfluidic technology may also be called lab on a chip technology. Because microfluidics handles such small liquid volumes, the technology may enable cost-efficient and high performance devices. Energy microdevices and bio micro devices are very god samples. Although microfluidics research has been conducted for decades in academia, the market potential is only beginning to explode. Microtechnology utilizes microscale features to either increase the efficiency of systems, or find innovative ways for doing things. In several cases both can happen. Microscale devices have features as small as one micrometer (one millionth of a meter, or 10-6 meter, or 1 µm). The technology started in the 1960s for the field of electronics but later and more recently, scientists have found that also mechanical devices can be miniaturized to microscales. 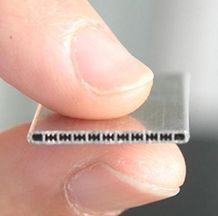 Micro Electro Mechanical Systems (MEMS) is a term used to describe mechanical systems on a chip like micro electric motors, microscale heat exchangers (for electronic cooling), and so on.